History. TORONTO ICE OWLS. Blind Hockey. Legend has it that the idea for a team of blind and visually impaired players began with a fist fight between two opposing Metro Toronto Hockey League coaches. Once tempers had cooled, fists had lowered, and peace been achieved, the two coaches decided to celebrate their armistice by going out together for a beer. Maybe it was the raised emotions of the ruckus fueled by a couple of cold ones, but the coaches soon found themselves discussing how they could do something for the game they loved so much. Something that would give back to the game in a special way. They came up with the inspired idea of a team of blind hockey players. They went further than that; they started the team, arranged for ice time in Mitchell Field Community Center in Willowdale, and coached the first participants to play. Mario made his first try almost thirty years ago, and is still out there every Sunday. Like many of the Owls, he’s a keen athlete. His also enjoys martial arts, an activity he has been involved in for decades. 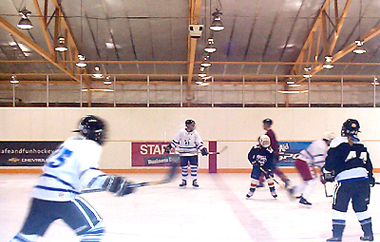 Over the years the Ice Owls have played in Maple Leaf Gardens and in benefit games and shows across the country. They are known for their community involvement and play benefit games for organizations and communities worldwide. They have played benefit games for the Ronald McDonald House, Cystic Fibrosis, Emily Stowe Shelter for Battered Women, the Children’s Wish Foundation and many more.